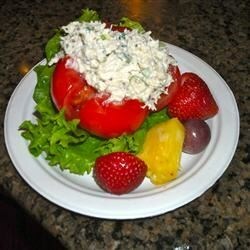 "This is a light and easy to make chicken salad. For a less tangy dressing, use light mayonnaise instead of the sour cream. Also, green onions can be substituted for the chives, if necessary." In a large bowl, combine chicken, celery, chives or green onions, yogurt, sour cream or mayonnaise, and tarragon; mix lightly. Cover, and refrigerate for 1 hour. Place nuts in a dry skillet. Toast over medium heat, turning frequently, until nuts are fragrant and lightly browned. Add almonds to chicken salad, and season with salt and pepper to taste. Serve immediately. This dish had too much celery, was a little dry and lacked a little taste. Next time, we'll make some adjustments with some of the ingredients to jazz it up. Delicious and easy! I loved the unique flavor of the tarragon. I didn't have plain yougart, so just added lite sour cream till moist. Great salad. I tried it with fresh tarragon and used the juice of half a lemon to give it a little zing. I used this as the basis for a killer mock chicken salad.